The attack was presumably triggered by cartoons published earlier by the satirical left-wing paper, which portrayed the Prophet Muhammad. The gunmen reportedly called out the victims by name during the attack, shouting: “We have avenged the Prophet." People mourned the victims by lighting candles and holding up pens in a show of support for press freedom. The same #JeSuisCharlie hashtag has been treanding on social media, with users stating that the attackers cannot take away their freedom. "I am free. I am free to think. I am free to tolerate. I am free to caricature. I am Charlie," wrote Twitter user Audrey Sommazi. Thousands gathered in Bordeaux in southwestern France. People rallied in front of City Hall in Rennes, western France. In Strasbourg, Lyon, Metz, Nantes and Toulouse, tens of thousands took to the streets on Wednesday evening. Other French cities also held vigils. 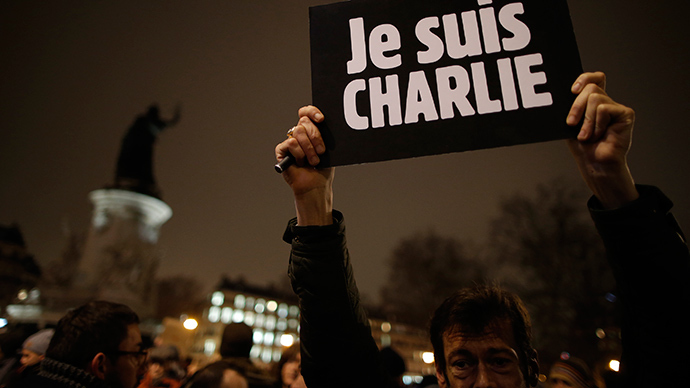 Protests in support of the Charlie Hebdo victims also took place in Berlin, Brussels, Madrid and London. In Moscow, people paid their condolences by leaving flowers, candles, and cartoons at the French embassy.